18 Dec Post by Andreas Filed under Andreas, Events And Shows, Seasonal Buzz. Tagged bouffant, bun, french twist, hair accessories, holiday hairstyles, nail trends. Holiday season is all about sprucing yourself up and polish your look. Connie, our Director of Beauty Services at Salon Buzz, and I were recently on NBC Chicago to share the hottest hairstyles and nail trends for the holidays. We’re encouraging our clients to wear their hair up. The three hairstyles we have are based on timeless, classic looks with a modern twist. 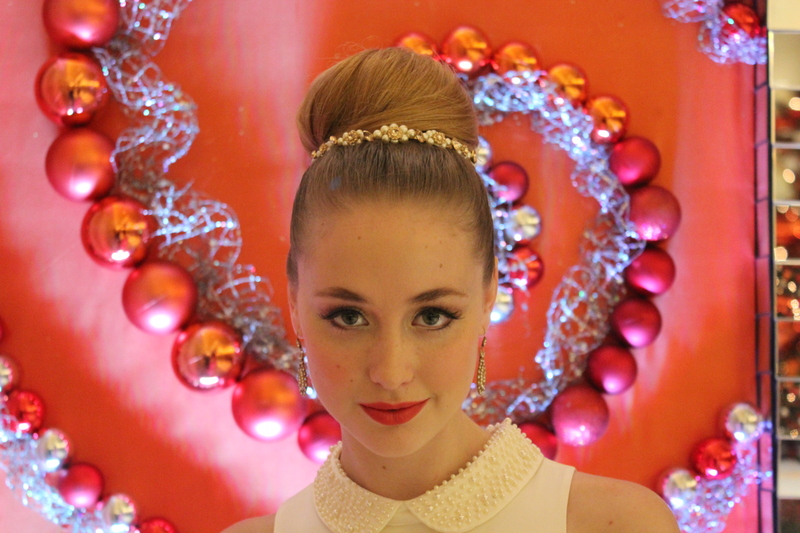 The chic bouffant bun can be worn as tightly or as loosely as you want, and the bun can be big or small. Depending on the tightness and size, this bun can be worn for a dressed up occasion or a more casual event. The Great Gatsby-influenced look has been seen over and over on the runways, but they can seem too “costumey” if it’s too polished. To give it a more casual yet sophisticated feel, we created the destructed bun, which keeps it fresh and modern. Accessories like a hairpin worn on the side help complete the look. The French twist is an all-time elegant hairstyle, and we made it more modern by pushing the twist up to the front to create an interesting shape. The headband towards the front further accentuates that the hair is high up above the crown. The fashion runways have brought nails into full focus, and shimmers, glitters, art and texture are hot trends for nails right now. It’s all about showing your individuality and creativity. The almond-shaped, oval nails are the hottest shape for nails, giving your hand an elongated and slender look. For colors, take a classic color like red, and give it a new look with some shimmer or design on the nail color. You can also create texture by combining light and dark shades, and adding crushed shells or rhinestones for eye-catching nails. Reverse French tips are in, and we love the metallic gold tips on burgundy nails. Celebrate the holidays in style with glam and elegance. Whether it’s a fancy holiday party or a casual daytime look, give a little extra care and attention to your hair and nails to complete your overall holiday look.